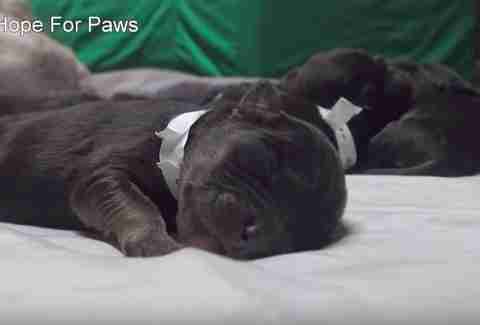 She waited patiently while rescuers saved her puppies, one by one. Spring the dog was homeless and living on the streets, but she’d usually stay in one neighborhood. Everyone there recognized her, and simply considered her the neighborhood stray. One day, Spring wandered into a resident’s yard, went to the back, and gave birth to nine little puppies. 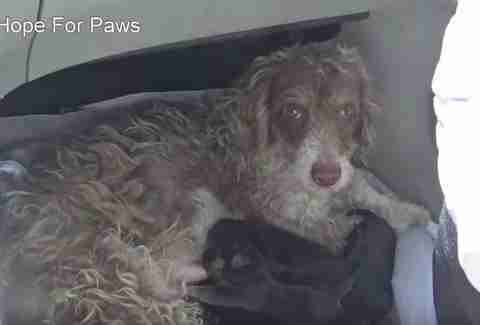 Startled and amazed, the woman contacted Hope for Paws in hopes that it could come and rescue Spring and her babies from a life on the streets. At first, Spring was wary of strangers coming near her and her babies, and the woman warned the rescuers that she might be a little aggressive. As soon as they arrived, though, Spring greeted them happily, almost as if she knew they were there to help her. 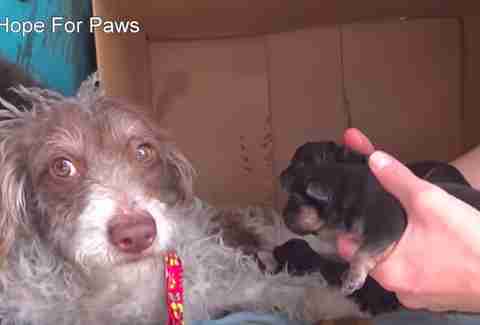 After introducing themselves to Spring, the rescuers went over to where she was keeping her babies and invited her to join them, hoping to gain her trust even more before trying to pick up the puppies. “I always invite the mom into the puppy's den with me, and have her show me around and try to get her to be comfortable with my presence, because it's one thing petting her and feeding her, but it's a completely different story touching her babies,” Hagar said. … and Spring was happy to watch each of her puppies be rescued. Finally, the entire family was safe, and the rescuers loaded them all up into their car. They were all checked out by a vet, and then taken into foster care. Rescuers named the puppies Dandelion, Jasmine, Monarch, Butterfly, Ladybug, Caterpillar, Dragonfly, Sunshine and Roly Poly. Spring and her puppies are doing wonderfully now, and once the puppies are old enough, all 10 dogs will be looking for their loving forever families. If you’d like to adopt Spring or one of her puppies, you can contact The Lovejoy Foundation for more information.